Earlier this month, we told you the exciting news that electro-pop outfit Metric had plotted a return to Nashville. They’ll be headlining Marathon Music Works on Nov. 18 with support from Seattle surf pop wunderkind Hibou. They are sure to play a good chunk of their latest album, Pagans In Vegas, along with some older fan favorites. Tickets are still available, but why spend your cash when you can win a pair with just a couple clicks? Read on for details! 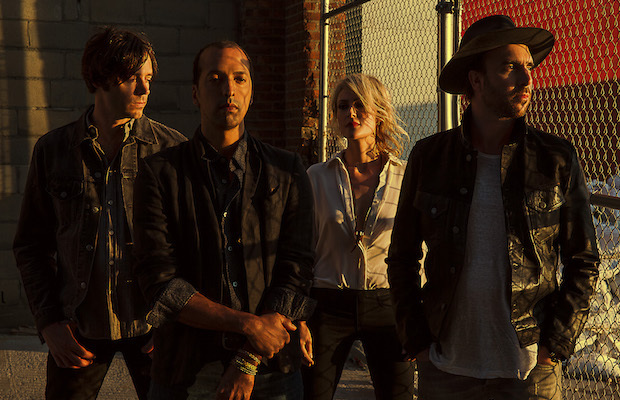 Established new-wave rockers Metric are returning to the Music City for the first time since opening for Imagine Dragons back in July. Since then, they’ve released their sixth studio album, Pagans In Vegas, which has been well-recieved. This isn’t surprising, as they’ve been honing their craft since forming all the way back in 1998. They’re also known as one of the hardest working bands in their genre, constantly touring and recording new material. Although their latest album just came out a month ago, the band recently revealed they have enough new music to hopefully release a follow-up sometime in 2016. It’s hard to describe the intricacy and depth that lies within the threads of every Metric song. Lead vocalist Emily Haines’ hypnotic voice, combined with punchy synths and irresistible hooks have only become tighter and better as the years go by. If you didn’t catch them opening for Imagine Dragons or Paramore at Bridgestone in recent years, this is the perfect chance to soak in a performance by one of the most impressive and seasoned acts in indie rock today, and also marks the group’s first Nashville headliner since 2012. Seattle based singer-songwriter Peter Michel, who performs under the stage name Hibou, has been heating up the blogosphere since 2013. His effervescent surf-pop sound quickly earned him a solid fan base, which has increased with the release of his first full length self-titled album in September. His music features a distinctly ’80s sound that still feels fresh and incredibly danceable. He’s the perfect choice to get the crowd loosened up before Metric blows away the crowd. Winner will be announced Wednesday, Nov. 11 at 12 p.m. CDT, and will receive one pair of tickets. Good luck! Win Tickets To Metric At Marathon Music Works! Metric and Hibou will perform Wednesday, Nov. 18 at Marathon Music Works. The show is 18+, begins at 8 p.m. (doors at 7 p.m.), and tickets are available to purchase for $27-30.